I feel like I’ve always had a goal in front of me. Something I’ve chosen. Something I have been in pursuit of. I wanted to be a hairdresser. I wanted to elevate my skills through education, and experience. I wanted to educate others. I wanted to own my own shop. But what next? What next has been some of the most rewarding part of my journey. 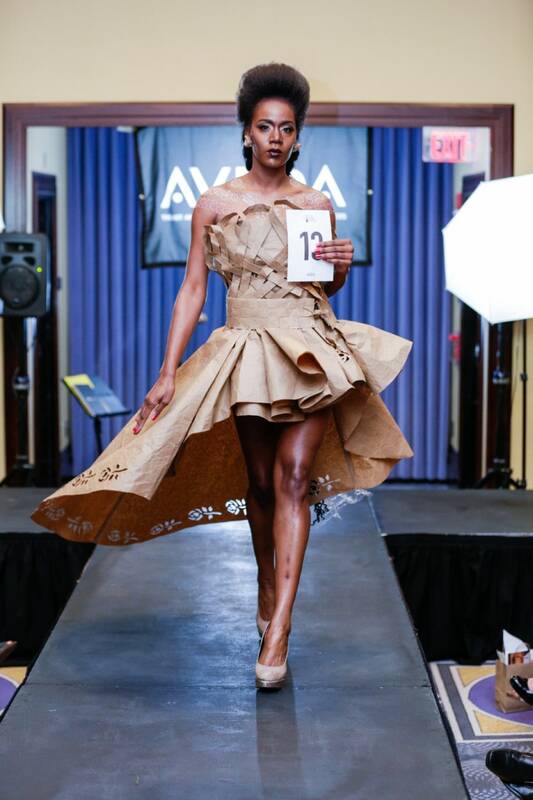 During a staff meeting at the end of February, I asked the group if anyone would like to participate in Aveda’s Green Carpet fashion runway. This was something I had been thinking about since its’ debut three years prior. 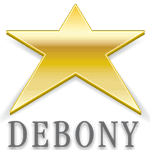 How exciting, I thought, it would be to lead a team from Debony Salon to compete in a catwalk contest! It was decided that anyone interested would meet at a chosen date and time and the brainstorming would begin! So it was on that given date, Tarmey, Blair, Sarah J. , and yours truly showed up to this meeting to hatch a plan! 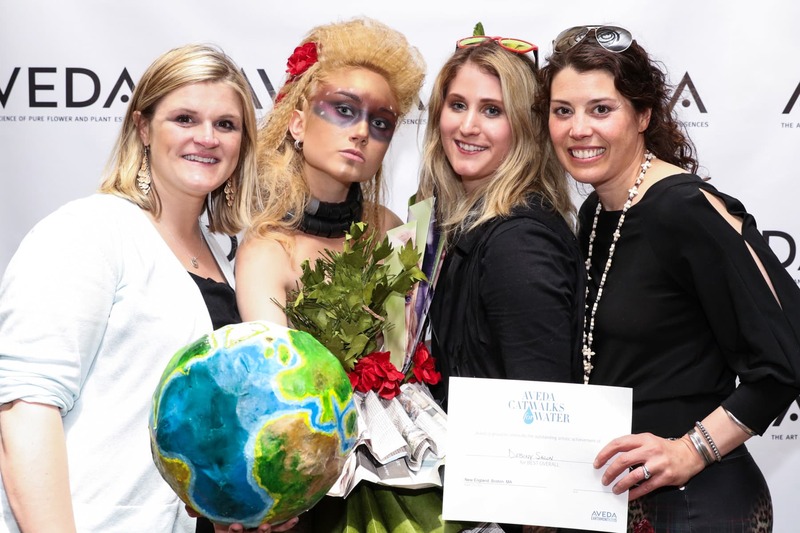 All things were taken into account, starting with a list of restricted materials for use, as this event was a fundraiser for Earth Month and The Clean Water Fund. Those restrictions included such things as: fur, feathers, any animal materials, raw forest materials, etc…Things encouraged for use were post consumer recycled content materials, and reused/ reusable materials. Armed with the rules we conspired to create an “Earth Warrior”, a gladiator protecting the Earth and her resources! Then came an original prototype. We were very lucky that Harlowe was willing to loan us a Barbie from her personal collection. Thanks Harlowe! We started collecting the materials to construct our look. With trips to Portsmouth, and Kittery we collected the foundations of our costume. The salon itself was a valuable resource! As it turns out we keep a lot of stuff. We could go into theater I swear. Christmas decorations, shipped last year from Nepal were a perfect accent fabric. It was paper and paper decorations, hand by the native women of Nepal, that brought a unique touch. Recylced news paper gave a lofty look and feel. Packing Materials from shipments we received made for a lovely trailer of tails to flow behind. 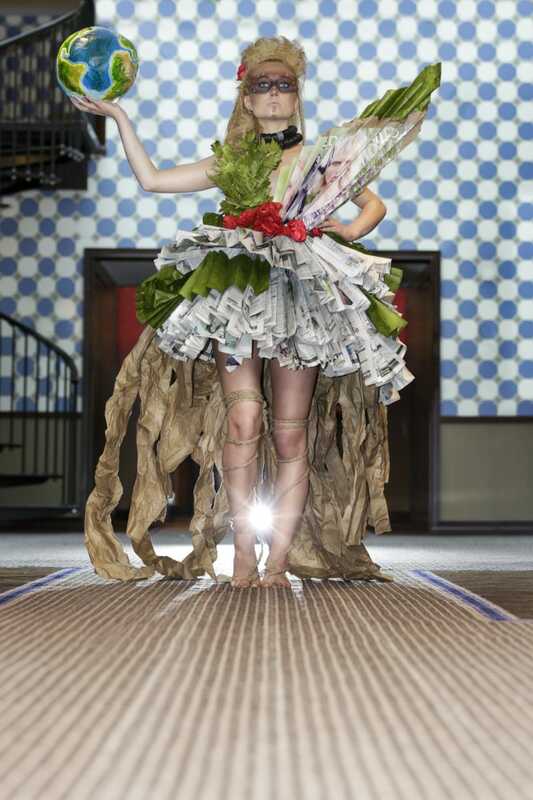 The Bodice was layered with hand made paper holly and pine. Finally, Marissa hand tied gladiator sandles of hemp twine. Special Thanks to Marissa who helped behind the scenes whenever she could. Unfortunately, during this time my dear mother in law, Joyce Diehl Passed. I was unable to make some of the next meetings to work with the team to further develop the look. The team picked up and moved forward. I was sad to not work more closely with them during this time. But what happened next was so amazing. Tarmey colored and cut her hair. She created a color with Aveda’s Blondeing Treatments to create a very current blonde of honey and wheat to showcase texture. This would be the foundation of our look. They worked tirelessly creating the costume. They practiced the assembly of the costume and it’s durability. All the while including me with texts and photos of their development and ideas. Finally, we were ready to go! 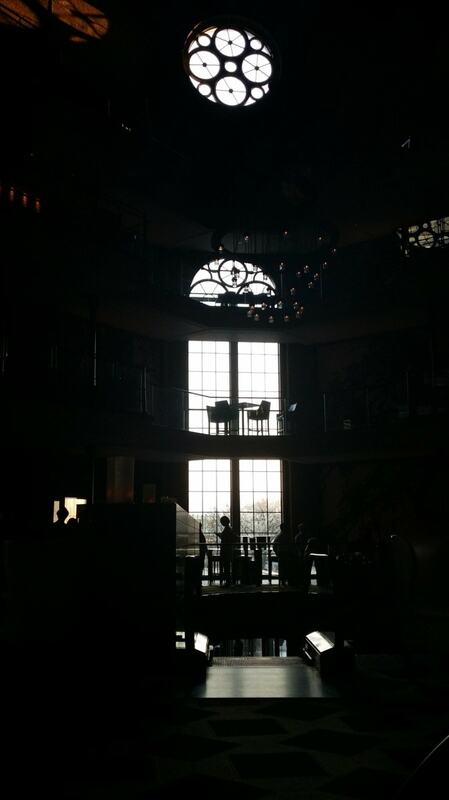 On Sunday May 3rd, we all made our way to the Liberty Hotel in Boston, Massachusetts. The hotel was the perfect venue, hosting us in what was once the Charles Street Jail. Beautifully restored, it was an architectural experience. All of the contest teams arrived to put their final looks together. 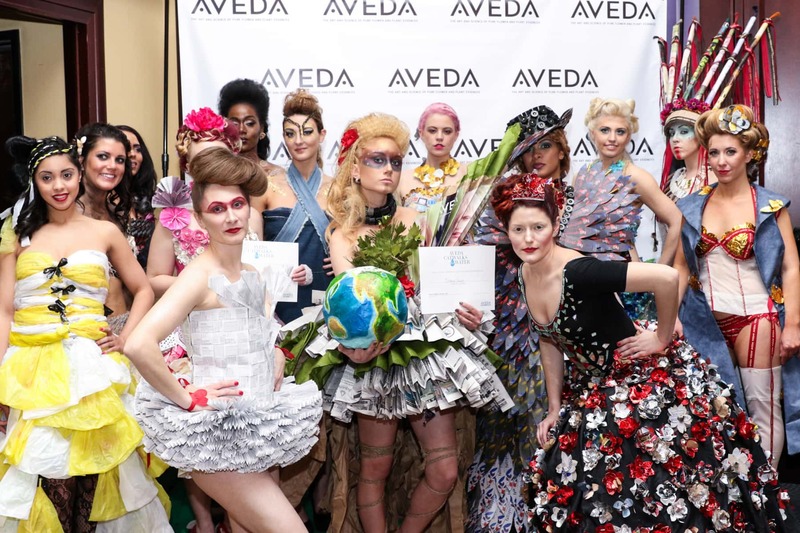 Teams from Portsmouth, Providence, Boston, and Aveda’s own Institute from Minneapolis were on deck to put their best re-purposed efforts on stage. We realized as we looked around that our competition was going to be stiff! We had two and a half hours to complete our look. We had to plan for practice run on the cat walk. Then, we needed to be prepared to be judged, prior the line up, for the final show. This was all nerve racking to say the least! 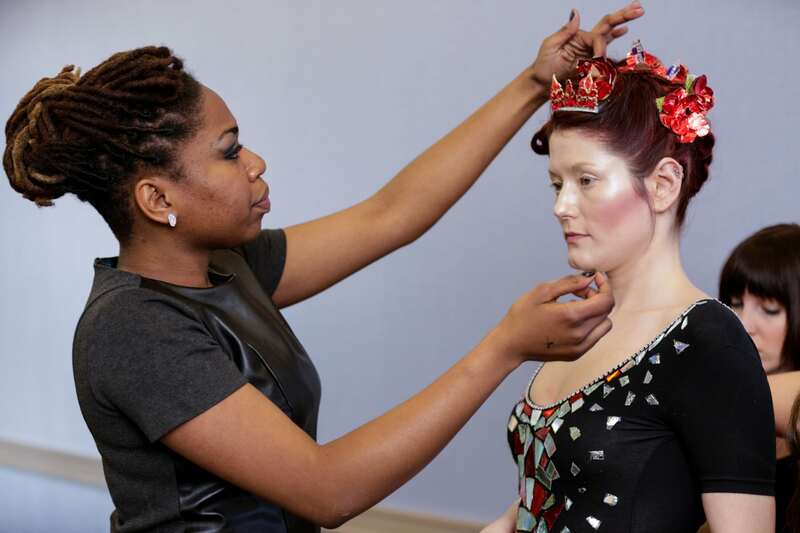 The cosmetic application was a process of layering and contouring. Blair was a natural with her background in painting and studio art. She was practiced and certain about the direction she was headed. I was impressed to watch her work among a room full of professionals, all of them bringing their “A Game”. She was unshaken. Here you see some of the materials for prepping the hair. Tarmey incorporated hair extensions for fullness and volume. She built volume and shape into the hair. She used crimping and teasing that created structure. She made every hair jump right into place. She was obviously very excited about her work! I was excited about her work! 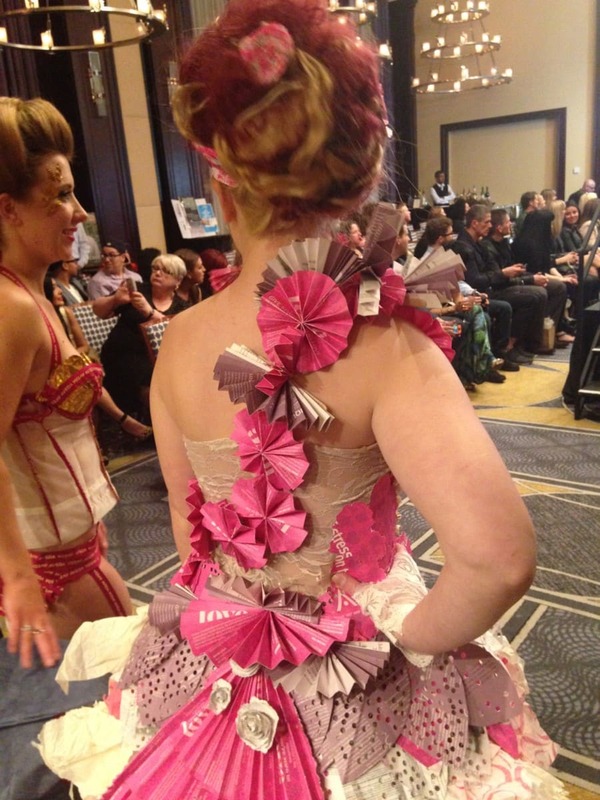 Before the actual walk down the runway, the judges would cast their critical glance over our creations. They would be considering The Best Hair, The Best Make up, The Best Costume, and The Best Over All. We were called one by one to stand in front of the panel, and so it began. Here is Sarah, our Earth Warrior, standing before them, donning the costume that she herself put so much time and effort into. 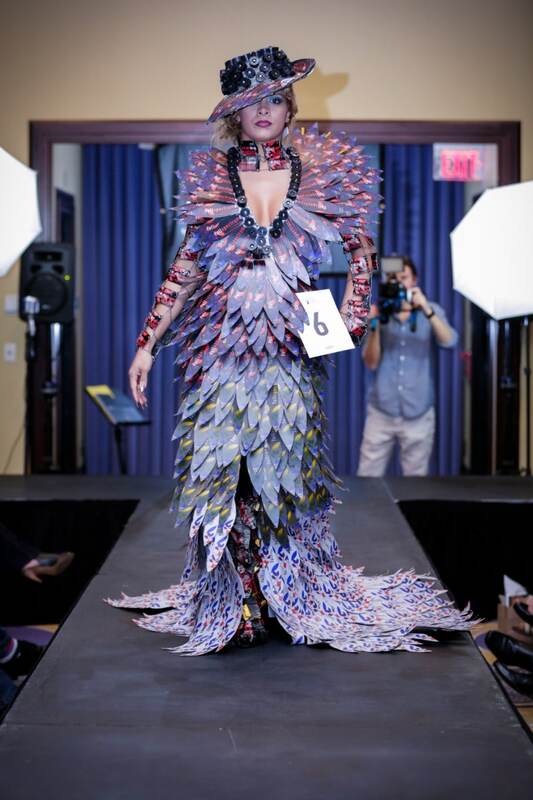 Sarah’s experience with theater, her incredible eye, and fearless approach to costume assembly with staples, twine, and paper constructed this unforgettable garment. It was at this point that I realized that some of the major work had just begun. We tied Sarah into this costume at 5:30pm. The show was expected to end around 10:30pm; she expected to play the role for five hours! Sarah not only carried the the costume, but more impressively, she also assumed the character of Earth Warrior: proud, focused, and very serious. She was intimidating. It was fantastic to behold this character roar to life. With much anticipation, the runway show was at its’ start, with all of its’ contestants lined up. 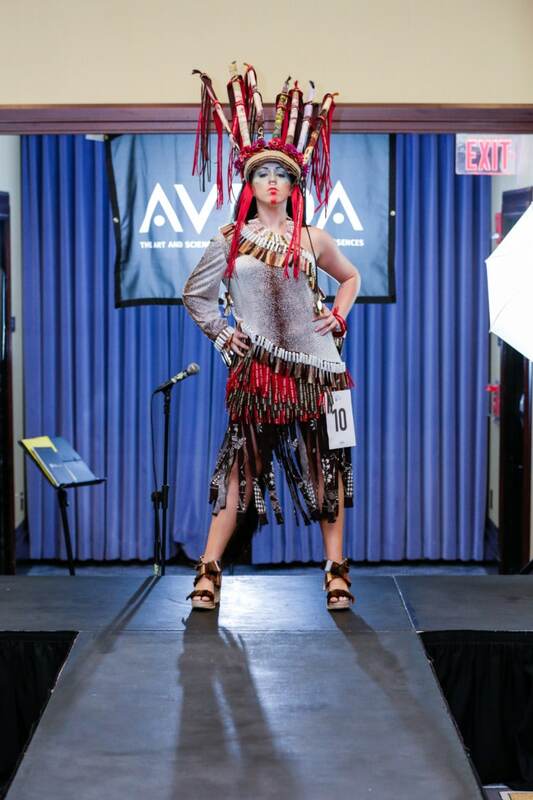 Each team prepared to put their best foot forward and bring their look before the final group of judges, the audience! 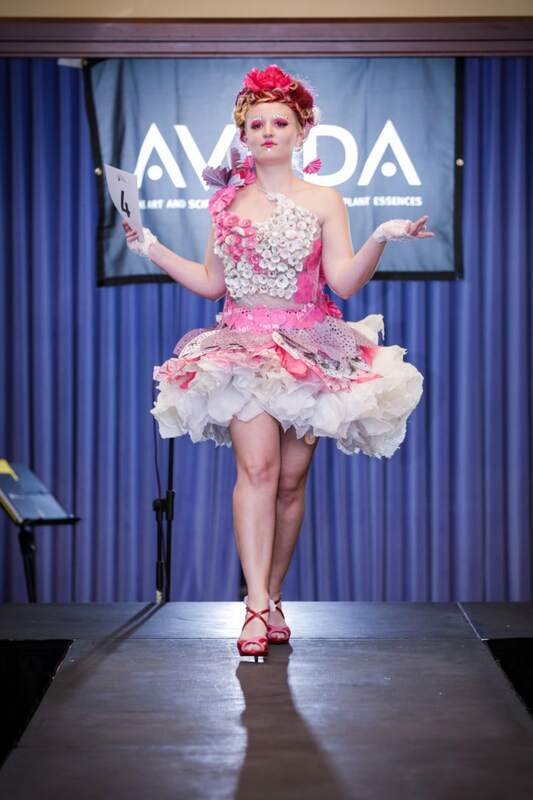 The team at Aveda sourced an app that allowed the audience to go to a site on their phone, enter a code, and vote! The results were instant! Oh, the times we live in. He is some of what we saw. 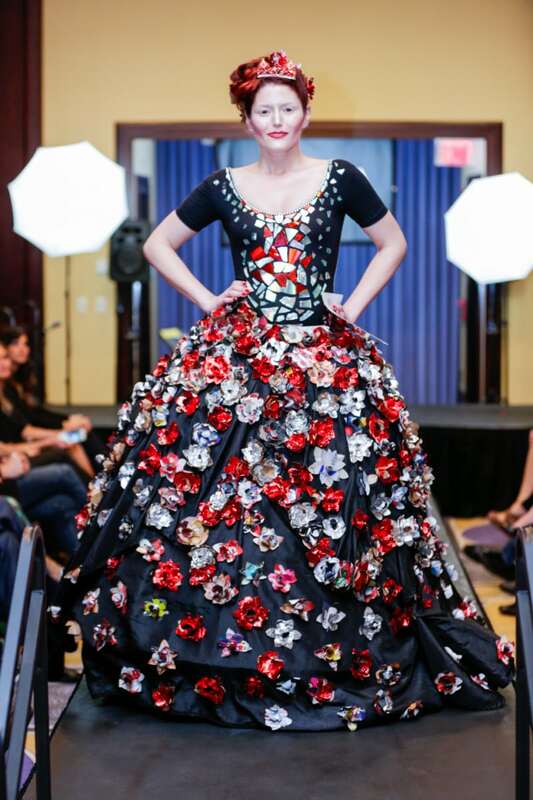 Each team was to be represented on stage to discuss their look and its inspiration. Blair offered to represent us in front of the crowd. She did just that representing for “the sticks” of Jackson, New Hampshire. 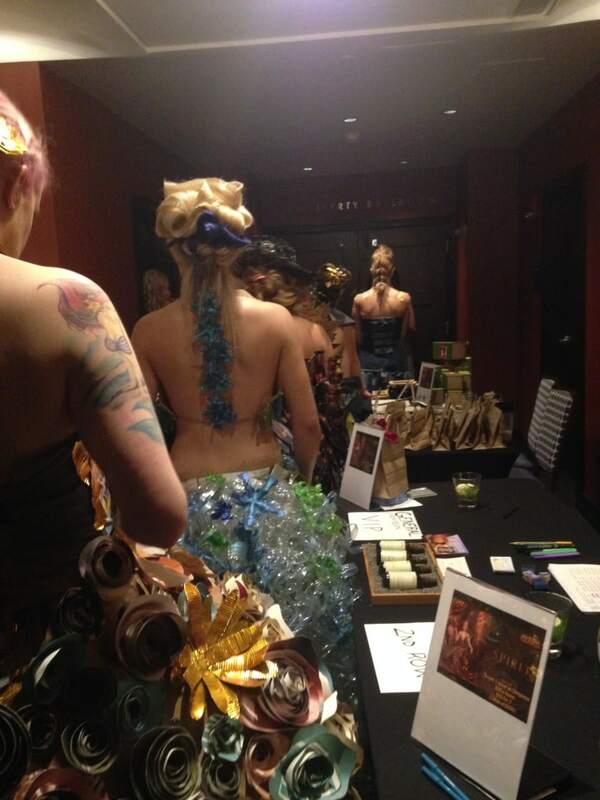 Aveda put together a terrific program. They raised $11,600.00 for the Clean Water Fund. That was the reason all of these fantasic looks had come together. It was a success. Then, finally came to the part of the night that we had waited for. Our gracious host, Evan Adler, began to announce the winners of each catagory: Best Hair, Best Make up, Best Costume… The peoples choice. Our name had not been called. I started to think about what I would say to the team. What did we take away from this experience? Would that be enough for them? Then in those last moments, with the last card in hand, Evan announced our name! I had to tell Tarmey in three different ways that we won! She was not believing it! Best Overall! What was actually happened that night wasn’t something was was put into a few sentences on stage. It was the cohesion of a team that developed ideas, created a plan, practiced the various components, all the while respecting each other and drawing on their strengths. Everyone that was around them during this time understood that. It came through in every once of their work. I was honored to be a part, it was an amazing part of the journey.